A large area of high pressure situated over the UK gave the 15 entrants to the finale of the Penrose Champagne Pursuits, light SE winds and anticyclonic gloom. We had to use the fishing quay to get on the launch, as the tide was again too low at the club slipway - some called it a sloping cow pasture. How rude. 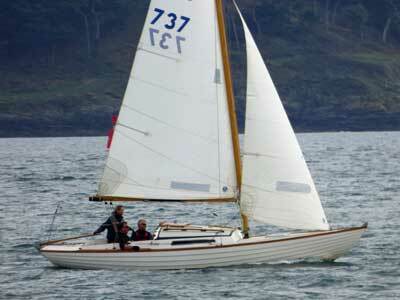 Len Cheshire in Sweet Friday was first away and took a good lead from the rest of the fleet. Third place overall was between Len on 31.5 points. Trifle on 31 points and Encore on 30 points as at Race 4. 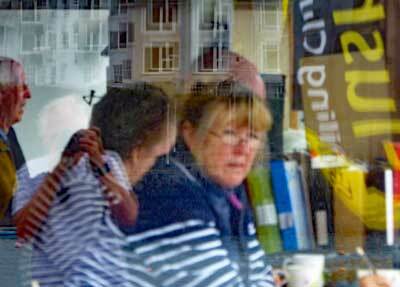 Mary Boon, John Cruise, then went off and both tried to stem the ever strengthening flood tide. Len managed to reach Governor buoy well ahead of John and managed to beat the worst of the current. Puffin, Mike Chard, Tomaray, John Myers, Ida, Mike Swingler, Aries, David Mitchell and Thirteen, Robin Roebuck then all took off on their respective start times and fought the flood down the fairway. 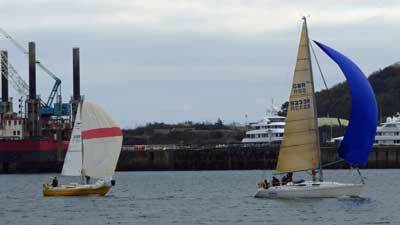 There was much tacking and maneuvering by them as we in Trifle set up for the start. At 1313 hrs on the dot we set off and traded tacks with Amneris down the fairway. Each gaining the advantage on starboard tack causing the other to dip behind. On about the fourth tack Amneris, Mike Robson appeared to stall and the boat got caught in irons allowing us to power away into the inner harbour. It is difficult this time of the year when so many yachts are laid up away from their moorings to see where the fairway edges are. A good call by my crew gave early warning of a mooring and we tacked just in time to clear it and set off toward Caldy and Frigate to keep out of the tide. 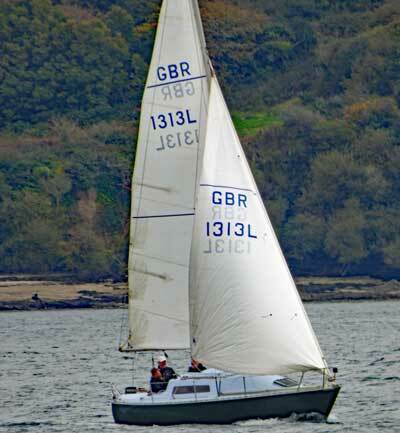 The wind was stronger than at first thought and we made the Trefusis end of the moorings on one starboard tack. 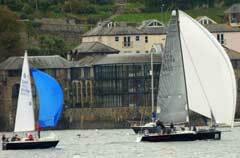 Some big lifts gave us the edge over Tomaray and Thirteen who were consistently headed in the tide. Sweet Friday and Mary Boon were well on their way toward St Just the second mark and we traded tacks with Tomaray as we went ahead of Thirteen. We rounded Governor just behind Ida and ahead of Tomaray and could see Aries and Puffin quite away ahead. It was tight but we hoisted the spinnaker and took off to play catchup with the boats ahead. The wind was shifty and soon we realized that it was heading us considerably. Tomaray who had not hoisted was closing back at us so we dropped the kite and re-established our course and gained some more speed. Ida was to leeward of us and continued to fly her kite and became more headed. So much so that we had a clear lead on her by the time we reached St Just. 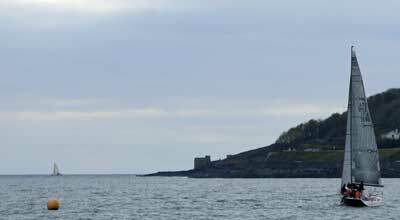 A white sail gybe onto port tack took us back toward Trefusis, the next mark. Ahead of us Sweet Friday had a massive lead with Mary Boon flying a shy kite trying to close the gap. 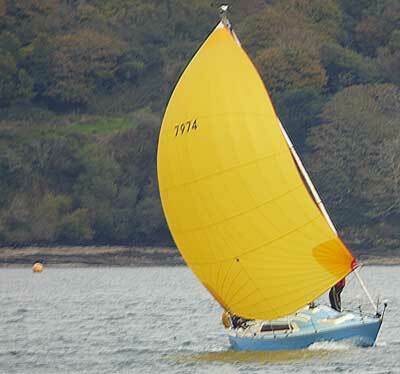 Puffin seemed to have selected fifth gear and was well to leeward and ahead of us. 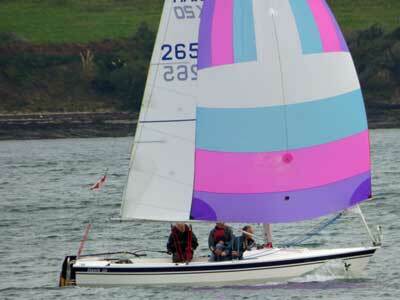 We hoisted the spinnaker and soon overtook Aries which got us into 4th place. Now for Puffin? 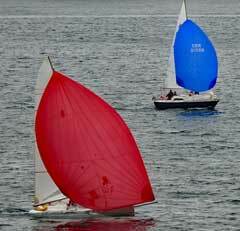 Sweet Friday came past us going back to St Just the last mark and we noted that Mary Boon was not flying a spinnaker, as it was too shy On that leg! She went past us and was in touch with Len. Puffin rounded and we followed on a close reach toward St Just. We could see the back markers all coming up toward us with a paint box of colourful kites. The boats ahead went high to get in more tide but I had kept an eye on Len who had kept low in more breeze and was already rounding St Just with an increased lead so we stayed low and kept our position with the leaders while increasing our lead on the followers. St Just was rounded and like John Cruise we went high under genoa after the gybe while the foredeck sorted the pole and the crew got the spinnaker ready for the last hoist of the season. 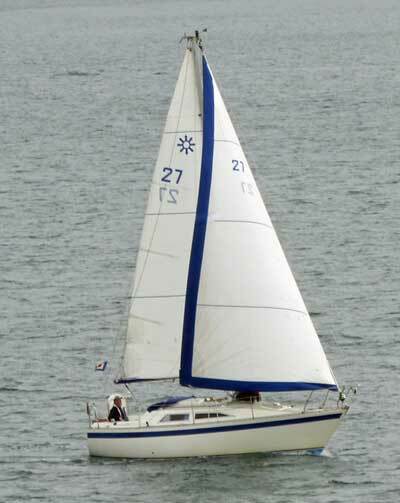 Up she went and we got in a fresher breeze and took off to play catch-up with Puffin. I headed as high as I could to get the tide up the fairway after passing north of the Vilt. 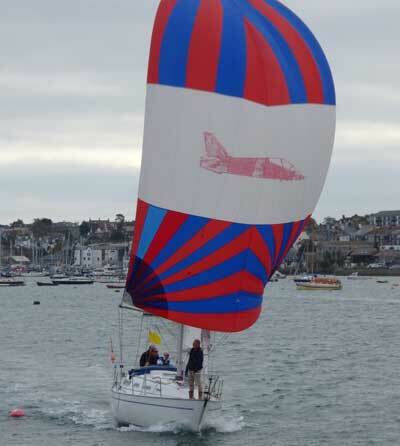 As we came level with Trefusis Vindscreen Viper, Duncan Adams went through our lee with his enormous red asymmetric spinnaker. A quick glace behind showed Insatiable. Tim Cunliffe and Atalanta, Stuart Higgins coming up rapidly. And still we could not get to Puffin, who was white sailing! The final run to the line saw Too Insatiable go through our lee as we gybed but we managed to hold off Atalanta and got a respectable 6th place. Sweet Friday won by a large margin with Vindscreen Viper beating Mary Boon into 2nd place. Puffin beat Too Insatiable. The overall series was won by Vindscreen Viper, Duncan Adams; Mary Boon, John Cruise was second; and Len Cheshire won a well deserved third place overall. What a great days racing! 15 boats (and 28 took part in at least one race in the series)! October 29th! What a shame its all over till April 2017!! Well done everybody and thanks to Penrose Sails our sponsors. Roger Little, the Race Officer ably assisted by Nessie Simcock, Inez Thompson and Jeannette Hill in the ops room, Inez and Malcolm for the results, Teresa and Annie for tea and cakes, John behind the bar and Giles for bringing us home safely. See you all at the club at 1930 for 2000 on Saturday 12th November for annual prize giving. All welcome and if you haven’t won anything come and cheer those winners on and pick their brains for next year. 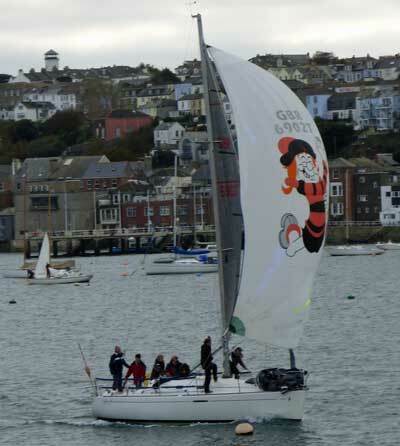 Aplogy: Somehow, Puffin, with her crack crew, who finished 4th in the race, was omitted from the photographs taken. She appears in some group shots, but not well enough to be easily identified.